For a long time I have made a point of saying that the person with Alzheimer’s does in fact know they have the disease, and it frustrates them. In the past 2-3 months I have come to another observation. The Alzheimer’s patient is like all of us in that he or she does not recognize the basis of all behaviors. In Kate’s case, she is most frustrated by the difficulty she has performing tasks like working with the computer or remembering where she puts things. On the other hand, I don’t believe she has any recognition of the lack of care of thought with which she does things. I think it was those things that were the first signs something was wrong, not a problem with memory. Just yesterday she had an experience that may illustrate this lack of recognition. She has lost several pair of clippers that she used to trim her shrubs. I know I have bought at least 3 or 4 since spring not including 2 I bought this past week. Day before yesterday she told me she had lost one of the 2 new ones. Yesterday she asked me to walk around the yard and help her look for them which I did. Neither of us found them. When she came inside, she said something like, “I just don’t know how I do this?” The way she said it, I was unsure whether this was simply an expression of frustration or if she really doesn’t know the cause of her behavior. 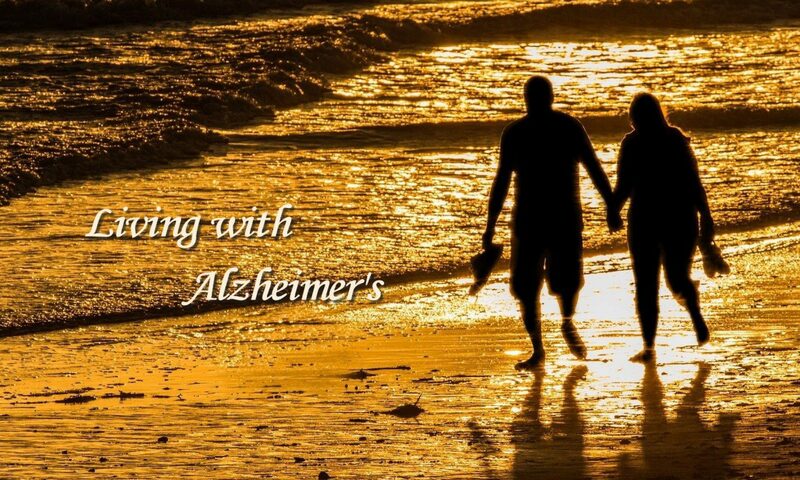 I am well aware that she doesn’t recognize how far along she is, but I have assumed that she grasps the fact that her Alzheimer’s is what causes all the problems like this one. I believe I was wrong about that. On an unrelated note, she came inside for some water about 45 minutes ago. When she saw me, she said, “I didn’t know you were here.” That made me stop and think about it. This is a Saturday morning, and I have been inside working on my SS lesson for tomorrow. She doesn’t usually know what day it is; so she was thinking it is just like every day. She works in the yard while I am at the office (though nowadays that normally occurs on MWF, not the other 4 days of the week). She was probably thinking I was coming home from the office. Then walked in the house only to see that I was here. Before going back outside, she asked me how long I had been at home. That gave me a jolt because I assumed she had grasped that I had been home all along. I thought a moment and said, “”Well, since I came home from getting my haircut yesterday afternoon.” She looked at me and said, “”That wasn’t funny.” I apologized, and she said, “”Well, it was a little funny.” I could not help wondering if she did not think it funny because I was making light of the fact that she can’t help getting mixed up on such things. Two days ago, she asked me where the church directory was. I told her the last time I had seen it she had taken it out of the drawer in the kitchen where we kept it. She said, “”That’s scary.” This was said matter-of-factly. She wasn’t making a big deal of it but it seems to me interpreting the situation as one in which her Alzheimer’s could mean the directory could be anyplace. Indeed, I have looked around the house without success. It really could be anyplace. Yesterday afternoon we went to a performance of Five Guys Names Moe at a small local theater. We were seated on the front row and the entire audience numbered about 20. During the final number in the first act, the actors invited members of the audience including Kate to join them in a conga line and they danced around the room. She joined in with little hesitation and seemed to enjoy it. During the first part of the second act, a member of the cast grabbed her hand and walked her up to the stage. Other cast members brought two other women up as well. Then the three were asked to take a seat in chairs set up on the front center of the stage. Kate sat in the middle. A cast member asked each one two questions: “What is your name?” and “Are you here with your husband or a date?” Kate spoke right up and in a loud (not too loud) voice said, “”Kate.” To the next question she said, “”My husband of 52 years.” We have actually been married 51 years, but I know where she got 52. We were in a discussion several weeks ago. I had said we had been celebrated our 51st anniversary in May and were now in our 52nd year. In an email earlier today, I mentioned this account to my friends, Tom and Carl. They wondered whether she had been more at ease because of the small audience. I told them I didn’t think so but that I do think she is a little less inhibited now which I believe is a function of her Alzheimer’s. Last night as we were driving to dinner, Kate said she had counted 8 people walking along the street. This is a habit she has gotten into the past year or so. She started do this after noticing that she sees more people walking along this street than she does other streets. She then told me that she had counted the walkers while listening to me. I joked about her being a multitasker. She then looked at me and said, “”Don’t count me out yet.” This is not the first time she has said this though it is not something she says all the time. I have heard her say this as many as 5 times (an estimate). This is another example of our light-hearted way of recognizing her situation but not dwelling on it or approaching it with sadness. At 8:20 this morning, Kate walked into the family room dressed for working in the yard and said sternly (as if in a huff), “”I’m going outside. If I’m not ready when you need to go (to church) then go ahead without me.” Thirty minutes before I wanted to leave, I went outside to let her know how much time she had. When she came inside, she picked up her clothes on our bed and said, “I put these here so you would know that I had picked out the clothes for church.” When it was time to leave, I went to her bathroom to check on her. She spoke rather harshly and told me to leave her alone. I heard her ask, “”Where’s my makeup?” In a few minutes she came out and indicated she was ready. Then she said that she didn’t have any make up on except for her powder. For the third time in as many weeks, she attended my Sunday school class. I showed two videos. One was a segment from 60 Minutes that featured Mercy Ships. Then I showed one about the work of Samaritan’s Purse in Sudan where they are helping to provide clean water. After the class Kate mentioned two times how good the class was. She really liked it. We went to the worship service in which one of our young associate pastors preached. This was his last Sunday before leaving for Louisiana where he is assuming the position of head pastor in a Presbyterian church there. He did a very nice job. Kate’s assessment of him was glowing. She said she thought he was the best preacher we have ever had. This positive reaction to people is not new and is what I sometimes describe as a childlike response. She just seems to be very impressed with other people’s skills. Finally, we went to lunch at Chalupes. She raved about the food and the consistency from visit to visit. I take both the huffy emotional behavior with me and the positive reaction to my lesson, Jonathan, and her lunch as a function of her Alzheimer’s. She wasn’t this way before. We have a continuing problem with clothes. As I have mentioned before, I made a significant addition to her wardrobe in February. At that time I was trying to make sure that she has clothes appropriate to wear to some of the foundation receptions and especially a board retreat in Asheville. Some of those things she has never worn. Others are misplaced. We bought 5 pair of pants. At least one or two need alterations, but she hasn’t been wearing the others. More recently, we bought 5 pair of pants and an assortment of tops and matching tops. She has worn at least two of these and a couple of the tops but they are being worn infrequently. Today I noticed she was wearing an older outfit to a funeral. I was also aware that this is an outfit she is wearing quite frequently. I waited until after the funeral and after we had eaten lunch. Then I asked about her new clothes and that I noticed she hadn’t worn something new rather than some old. She was offended that I had said anything and indicated that the other clothes were not appropriate. When we arrived home, she apologized for getting angry with me. I think this is very hard for her and must not forget that, but I need to figure out a way to make sure she is dressed appropriately. We had another of those situations in which she fakes her way through a conversation. We ran into a neighbor that she would have recognized in the past. When I asked her if she remembered the person, she said she had no idea. I said, “Well, you faked it well.” She indicated that she does a lot of that. During the past week Kate has expressed concern about being at home all the time. The first sign of this was the conversation we had last week when she wanted to know if she could drive again. Since then she has commented that she needs something more to do than just work in the yard and on jigsaw puzzles on her iPad. This is something that will require more planning on my part. This morning I woke up at 4:11. I remained in bed until 4:33, but my mind was occupied by two things. First, the nominating committee of the foundation is meeting in the morning to deal with a sticky issue of who will be the chair for the upcoming year. Second, my mind kept wondering how I will work out entertaining Kate if I have more obligations with the foundation, church, and presbytery. I also wonder how I can present supervision of Kate without offending her. She continues to want to display her independence. She doesn’t even want me to help her out of the pool. I volunteered our participation on the visitation committee at church. We had our first meeting with that group yesterday. They meet twice a month and have a lunch. This should help get her out of the house and have more contact with other people. I also need to work out arrangements to have lunch with people like Angela and Marvin Green. I have also spoken with Kate about volunteer opportunities. Yesterday I did tell Libby, our housekeeper, about Kate’s Alzheimer’s. I also told her I would want her help in keeping the house in order but that right now Kate wants to handle that herself. The problem, of course, is that she really doesn’t. I am also thinking about the implications of future travel. I don’t have any plans for travel after our cruise in October. I think I will wait until after the first of the year and see how she is doing. We will continue to make trips to family. This morning I had fixed a glass of ice water and placed it on the kitchen counter where I was preparing to use my computer. Kate came in and put ice in a glass and put it on the island. She also brought in an empty glass and put it on the counter next to the sink. In a few minutes she pointed to my glass and asked if it were hers. I told her it wasn’t, that hers was on the island. Then I said (pointing to the empty glass on the counter next to the sink), “That one is yours too. We both laughed, and she gave me a hug. We both knew that I was joking about her memory in that she had put 2 glasses in the kitchen including one to which she had added ice but had forgotten. All this occurred in a matter of minutes. I then said, “That was mean. I shouldn’t have said that.” She wasn’t at all troubled and said something about liking my humor.